The correct ratio of air to water is critical for the proper, efficient operation of domestic, potable water supply systems. Insufficient air in the pressure tank will cause excessive operation of the pump; while too much air may be carried into the piping, causing water-flow problems in the form of noise and sputtering at the faucet. 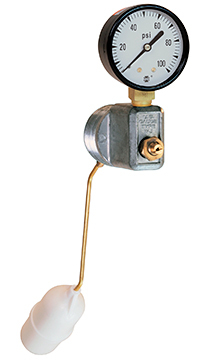 With its simple, efficient float design, the Model NL310WJ and NL300L low lead air volume control regulates the amount of air in a shallow well system by constantly monitoring the level of the water. High water level indicates a lack of air in the system, and will cause the float to open the control’s air inlet valve. Air from the control is then drawn into a pump, where it is mixed with water and transferred into the system. As more air is introduced into the system, the decreasing water level will cause the float to fall, eventually closing the air inlet valve and shutting off the supply of air to the pump; until the water level again increases and the process starts again. The optimum volume of air to water in the system is thus constantly maintained.